Extremely courteous and knowledgeable. Explained her findings and asked if I had any additional concerns. Let me know whatwarnings signs to look for and looked forward to my next visit! Extremely courteous and knowledgeable. Explained her findings and asked if I had any additional concerns. Let me know what warnings signs to look for and looked forward to my next visit! She was very nice and she wasn’t frustrated with me when I couldn’t see the letters. She even let me tryagain so I could get a better score reading. She was very nice and she wasn’t frustrated with me when I couldn’t see the letters. She even let me try again so I could get a better score reading. Dr. 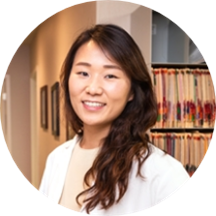 In Ae (Grace) Choi has clinical expertise in optometry and obtained her medical degree from the Salus University, Pennsylvania College of Optometry. Dr. Choi is excited to bring her knowledge to Northern New Jersey Eye Institute based in several communities of New Jersey. Dr. Choi believes in providing outstanding eye care and greatly invests in delivering quality care as well as professional patient service. As an optometrist, she is proficient in managing eye infections, allergic eye problems, and double vision. Dr. Choi dedication and patient-centric care routine is unmatched. She believes that the eyes are the windows through which you can view the beauties of the world. She strives hard to educate her patients on eye care and encourages them to focus on improving their ocular health. Grace was very nice and professional, would recommend her and visit again! very good doctor, great personality. She was an amazing doctor and would totally recommend. Very quick, professional, takes her time, and made me feel very comfortable! Friendly, wonderful and great bed side manner. Very pleasant, took her time.